Petclub.com | Does Your Pet Have Dental Dilemmas? Does Your Pet Have Dental Dilemmas? Dental care for your pets can easily be overlooked and forgotten about. We may even joke about how unpleasant our pet’s breath is, but dental care is in fact very important and if left unmanaged for a long period of time; can result in plaque and tartar build up which eventually leads to nasty diseases in the mouth such as periodontal disease and gingivitis. Taking care of your pet’s teeth by brushing, providing dental food and treats and regular check-ups on your pet’s teeth can keep their mouths healthy and also save you forking out a lot of money repairing the damage if things are left untreated. Periodontal disease affects both cats and dogs. It is a bacterial infection of the tissue surrounding the tooth and takes hold in 5 progressive stages. It starts out as plaque, and then calcifies into a hard rough substance called tartar. If left to spread, the plaque and tartar can lead to gingivitis – an inflammation of the gums which worsens over time. This leads to infection and in the final stages of periodontal disease, the surrounding soft tissue and bone become infected and the teeth become loose. This process is very painful for your pet and can easily go unnoticed as inside their mouth is not somewhere you’d tend to venture very often! What can you do to ensure your pet’s mouth and teeth stay healthy? Firstly, you should get our pets teeth examined by a vet or nurse at your veterinary practice. 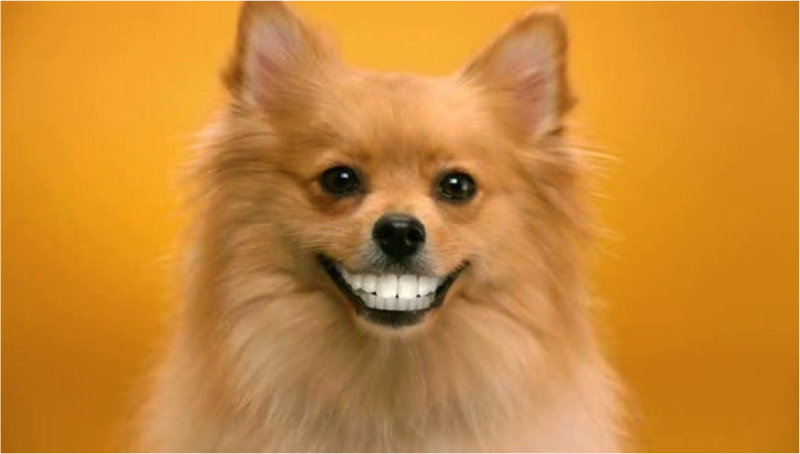 Your pet’s teeth can be evaluated and you will be given advice on what care will be best you for pet next. If necessary, your pet may need to undergo a dental procedure; either a professional scale and polish which gets rid of tartar and plaque build-up or if you’re pet has a worse case of periodontal disease, extractions may be needed. If you have a very young pet or there is only a small amount of plaque and tartar build up on the teeth you may be recommended an oral hygiene programme to start at home, this will also be recommended for pets after they have undergone a dental procedure. This will involve daily tooth brushing as it is considered to be the most effective way of removing plaque. Soft bristled tooth brushes and veterinary toothpastes are available for cats and dogs and are safe to use every day with no need for rinsing. 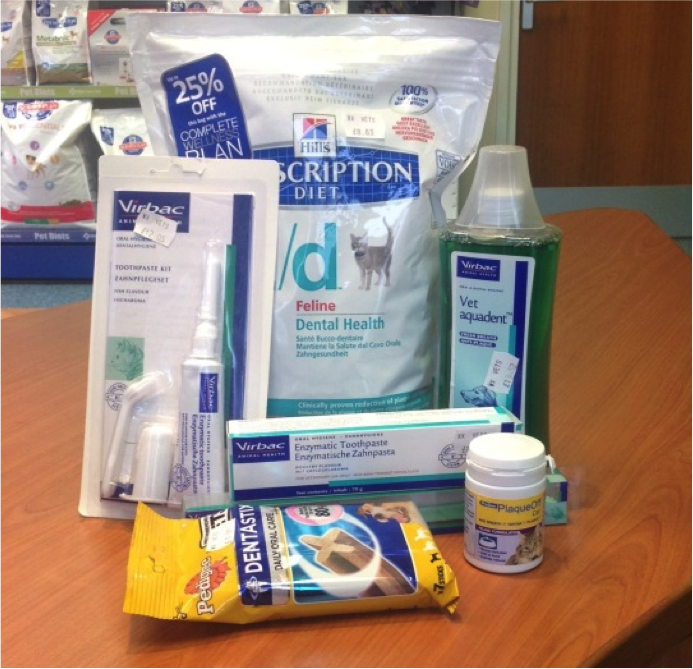 Other products such as antibacterial oral rinses, specialised dental treats and foods and even tooth wipes are also available to keep your pets mouth healthy. Ask your local veterinary practice for advice and tips on pet oral hygiene and advice on methods for brushing your pet’s teeth. Not all pets are willing to sit still while you brush, so your vet or nurse can give you a demonstration. It’s usually best to introduce the taste of the toothpaste for a week or so beforehand and get your pet used to you being near their mouth. What about our other furry friends? Rabbit’s and guinea pigs teeth grow throughout their entire life and are filed down naturally by the foods they eat. This is why a good diet of hay, specialised rabbit food and fruit and vegetables are good for not only their digestive health but also their dental health. Dental check-ups at the vet twice a year are recommended to ensure your rabbits and guinea pigs teeth are healthy and not overgrown. With hamsters it is very similar. Provide good quality food for your hamster and also chews and toys are available. You can check your hamster’s teeth at home by holding them gently in your hand then use your other to pull back the skin around the neck; this should cause your hamster mouth to open. Be on the lookout for misaligned teeth, bleeding, inflammation, redness, and swelling around the gums. If you see anything you don’t think is right, call your vet’s for a professional opinion.